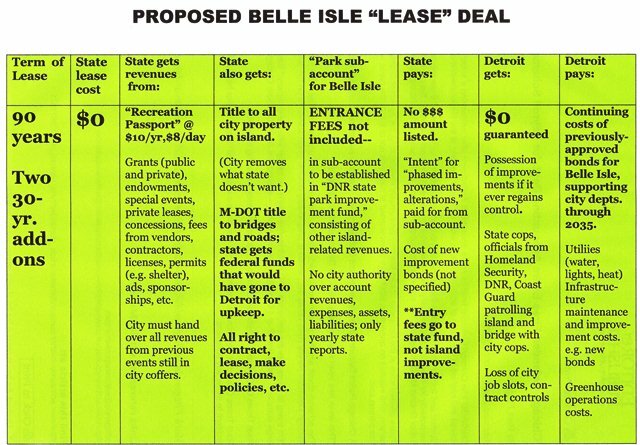 90 YR. BELLE ISLE ‘LEASE’: ENTRY FEES GO TO STATE; FED/STATE COPS TO PATROL; COUNCIL HEARING MON. SEPT. 17, 1 P.M. Advisory board dominated by governor’s appointees established. DETROIT – A proposed state “lease” of Belle Isle, the largest island park in the country, a “jewel” deeded to Detroit in 1873 and designed by the same architect who designed New York City’s Grand Central Park, is angering many here in the world’s largest Black-majority city outside of Africa. Aerial view of Belle Island, the largest public island park in the U.S. The deal, announced by Michigan Governor Rick Snyder and Detroit Mayor Bing Sept. 12, would last for 90 years (including two renewals), cost the state no rent, put newly-instituted entrance fees into the state’s general fund, have state and federal police patrol the island along with city cops, and leave Detroit citizens to pay off outstanding improvement bonds for the island. There is no specific financial commitment by the state in the lease for improvements. The lease provides for an 11-member advisory board, with Gov. Snyder appointing or approving seven of the members. The City Council must still approve the lease, and is set to hold a discussion on it Mon. Sept. 17 at 1 p.m. (Click on CC cal09-17-12 – COW – Belle Isle). Public comment is invited. Detroit COO Chris Brown (r) discusses “city employment terms” with Bing advisor Atty. 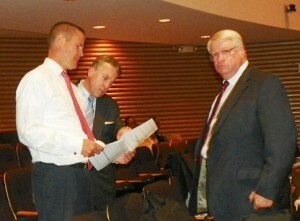 Michael McGee, a co-author of PA 4, and PMD Kriss Andrews (r) prior to a meeting of the PA 4 financial advisory board June 28, 2012. Bing would not discuss what will happen if the Council votes down the lease. Under the consent agreement, decisions of the Council and even the Mayor can be overridden by a Financial Advisory Board, Project Management Director Kriss Andrews, State Treasurer Andy Dillon, and Snyder. A referendum to repeal PA4 is on the state’s November ballot, temporarily suspending the Act, but Snyder and Bing have insisted that Detroit is still operating under the consent agreement, and that it will stand even if PA 4 is repealed. BELLE ISLE BELONGS TO US! 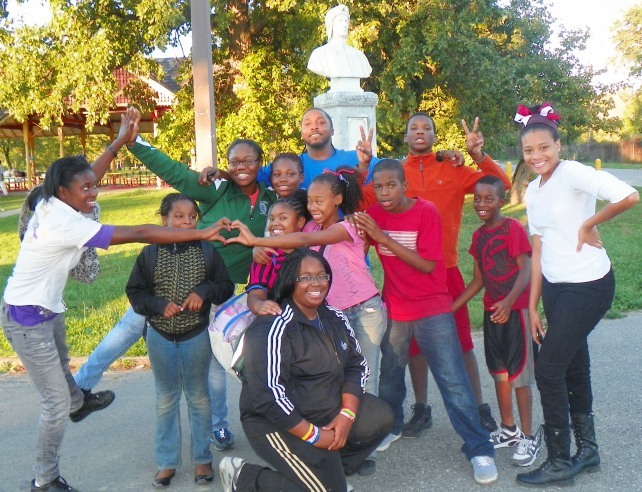 Youth cavort in front of statue of Dante Alghieri on a beautiful Saturday on the island, Sept. 14. They included Jimmy Young (third from left in back showing victory signs), Ms. Hamilton (r) and Breanna Dean, (center front). “Belle Isle is a safe place for the kids,” Young told VOD. Nationally-known Detroit-born poet Jessica Care Moore and her son King Thomas Moore in front of giant slide, which has been closed for several years. 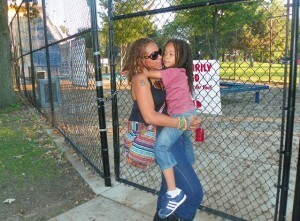 Jessica Care Moore, a nationally known poet from Detroit, was out enjoying the island with her son King Thomas Moore, who had just turned six. Young King Thomas said, “I want the giant slide to be open.” The famed slide on Belle Isle has been closed for several years, and it is not clear whether the state will re-open it. Many other children were seen approaching the slide, turning away disappointed when they saw the locked gate. 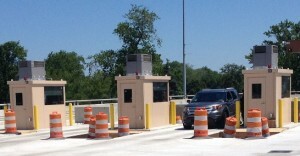 New M-DOT toll booths at the Bluewater Bridge, an international crossing into Canada. 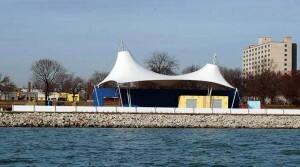 Will such booths likewise block the Belle Isle Bridge? 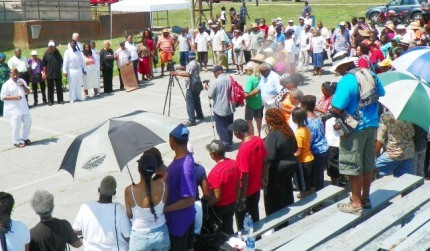 Councilman Kwame Kenyatta addresses rally against Belle Isle takeover Aug. 1. He co-sponsored the rally with Councilwomen JoAnn Watson and Brenda Jones. Speakers included the Rev. Charles Williams II and other community leaders. 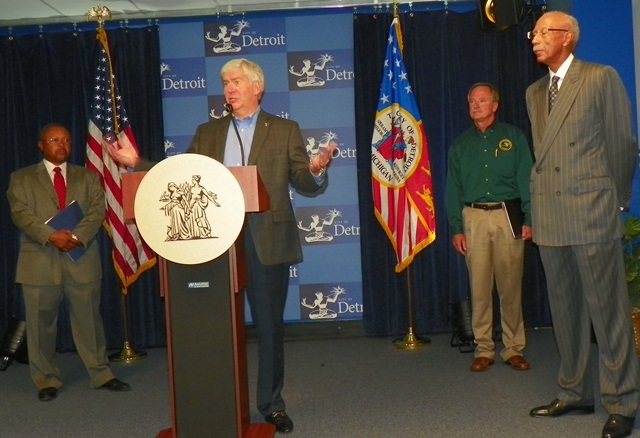 Snyder, Bing, and George Jackson, president of the private Detroit Economic Growth Corporation (DEGC), glossed over specifics during a press conference Sept. 12, touting the deal as “an equal partnership.”. Snyder vision of Belle Isle, patrolled by friendly state trooper to keep it “safe for families. Photoshop version was handed out to media at press conference. Snyder refused to set a dollar amount on state investment or give other details of the improvements, also not included in the proposed lease document itself (see link at end of story to read entire document, not just executive summary given to media Sept. 12.) The lease does say that any improvements will be subject to the availability of funds. “Pastors, community leaders and citizens, has the time come to take to the streets and shut Detroit down–no cars in, no cars out?,” asked former mayoral candidate and community activist Jerroll Sanders in a column on her Facebook page. Sanders recalled her childhood basking on the island’s beach, which has a gorgeous view of Detroit’s downtown skyline. 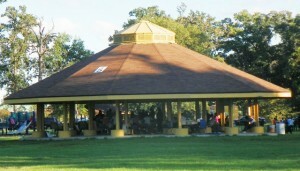 During the warmer months, national family re-unions, church, union and neighborhood picnics, concerts and other events fill the island. It is one of the few places left where Detroit youth can “cruise” on week-end night nights in a dating ritual that is decades-old and continues on major roadways in Detroit’s suburbs. Mayoral candidate Tom Barrow in 2009. 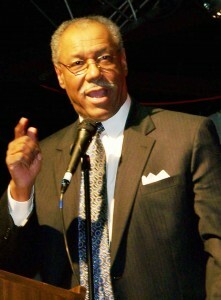 Tom Barrow, who also ran against Bing in 2009 and is appealing the election results to the U.S. Supreme Court, called for the people of Detroit to vote on the proposed deal. Riverfront Conservancy runs Detroit Riverwalk, shown here east of Belle Isle bridge. 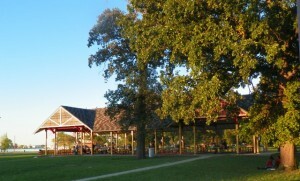 VOD visited this park Mon. Sept. 11 and found the restrooms closed, and the park patrolled to keep the homeless out. 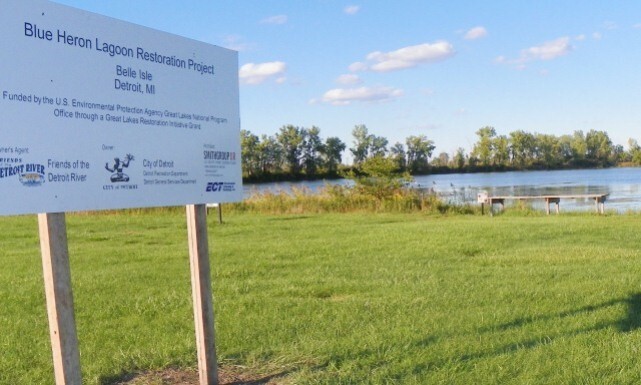 In contrast, Detroit’s private Riverfront Conservancy, run by prominent corporate executives, received $44 million in state and federal funds in June, no strings attached, to fix up the east riverfront across from Belle Isle. The deal converts the island into a state park run by the Department of Natural Resources. Vehicle entry after March, 2013 would require annual purchase of a $10 state “Recreation Passport.” A previous law included an $8 daily fee for non-residents, such as relatives attending family re-unions from out-of-state, but the daily fee is not mentioned in the new regulations. 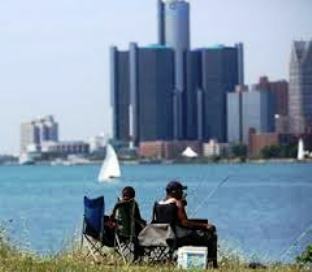 Fishing on Belle Isle with beautiful view of downtown Detroit skyline. Such fishers could be stopped by “conservation officers,” who are state troopers, to ask them to show their fishing license and state ID, among other requirements. The lease additionally says that all unspent revenues the city has collected for the island until now (that includes rthe Grand Prix, APBA Hydroplane races, breast cancer walks, suburban bicyle marathons, Free Press Marathon), and all city equipment and property on the island, will go to the state. Funds directed to Detroit from public and private agencies including the federal government will now also go instead to the state instead for administration by the DNR. The APBA has been sued for racial discrimination by not allowing Black hydoplaners to race. Look at the video above closely: are there any Black folks in evidence?” Is Snyder making Belle Isle safe for the APBA, Grand Prix, etc.? Federal EPA re-development of Blue Heron Lagoon, currently on-going. The EPA is also re-develping Belle Isle’s south fishing pier and has granted other funds to Detroit for Belle Isle in the past. These would go to the state under termas of the proposed lease. Bing earlier railed against any 90-year lease of the island, and is presenting this option as a 30-year-lease. However it automatically includes two 30-year renewals unless the city opts out when the time comes. This picnic shelter near the beach was totally renovated only last year. Snyder claimed an advantage of the lease would be shelter improvements, but a VOD tour of Belle Isle Sept. 14, 2012 showed most shelters in good repair. Snyder said during the press conference that bonds for improvements to Belle Isle will be proposed and paid for by the state. However, the state is not assuming payment of outstanding bond debt for Belle Isle (part of the City’s Recreation Department), and any other city department which has instituted improvements on the island. 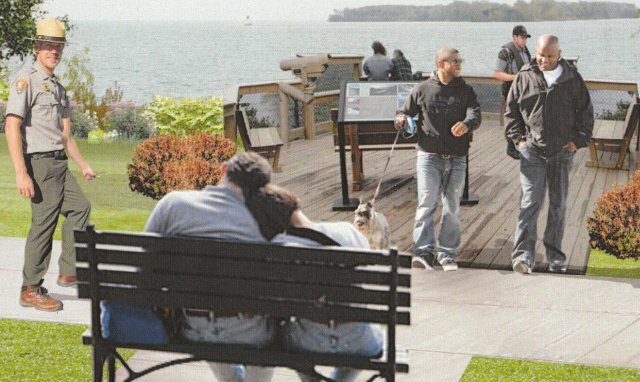 Detroiters approved bond proposals which included upgrades that would include Belle Isle in 1997, 2000, 2004, and 2009. Family and friends enjoying Shelter No. 3 on Sept. 14, 2011. According to documents from the city’s Fiscal Analyst Irvin Corley, proposals for “Museums, Libraries, Recreation and other Cultural Facilities” totaled $197 million. Bonds for Public Lighting were $72 million, for Transportation $46 million (city buses operate on Belle Isle), and public safety $219 million (Detroit police have a station on the island). Those amounts do not include interest rates for the bonds, most of which are to be paid on by the city through the year 2035. Detroit Water and Sewerage bonds would add to the total. 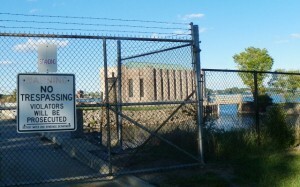 Detroit Water and Sewerage facility on Belle Isle. It is not clear exactly what amounts of these bonds have been expended on Belle Isle alone. The lease leaves Detroit with the continuing responsibility for maintenance and improvements of all utilities on the island, except for the improvements necessitated by future state projects. That includes water, lighting, and heat for facilities like the island’s “casino” and the Detroit Yacht Club, which pays $1 a year for land it uses, launching yachts and boats for the well-to-do from its docks while hosting social events as well. 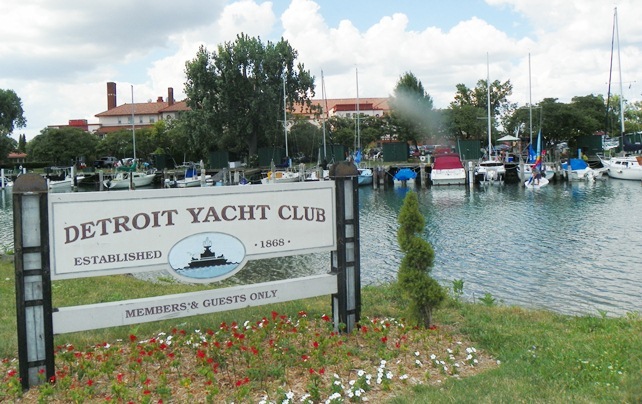 Ironically, according to historical documents, the City gave eviction notices to the Yacht Club and the Detroit Boat Club in 1969 because they would not admit Blacks. When they relented, they were allowed to continue their $1 a year lease payments. 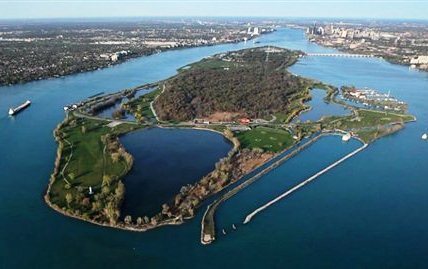 Wealthy Detroit Yacht Club pays $1 a year to lease prime riverfront land; state will pay nothing to lease whole of Belle Isle for 90 years. 4 Responses to 90 YR. BELLE ISLE ‘LEASE’: ENTRY FEES GO TO STATE; FED/STATE COPS TO PATROL; COUNCIL HEARING MON. SEPT. 17, 1 P.M. If the state does not take care of the park you believe the city will without funds for the state? Detroit has no money so where will the money come from if the state simply stays out of it? Will the park become a beautiful place again without help? This is merely a start. It’s called helping. It isn’t perfect but it is still help that the city needs. Why do you feel that the city can do without this help? First off, to correct the writer of the article, the proposed lease is only for 30 years, with two possible 30-year extensions; not 90 years with two 30-year extensions as indicated in the article on VOD. Secondly, park revenues from grants and donations would go into a DNR account set aside for Belle Isle improvements and maintenance, and the balance would be turned over to the city when the lease ends; it does not say anywhere that the funds would go into the state general fund. The two facts above came from the article on mlive.com; the link is http://www.mlive.com/news/detroit/index.ssf/2012/09/belle_isle_deal_with_state_-_s.html. However, I’m not sure where you got your information from since it is incorrect, but I’m assuming you got it from somebody opposed to the state taking over management of Belle Isle. To see the State DNR take over management control of the isle means that improvements can be made to improve the “quality of life” for all residents. If Detroit wasn’t in the business of mismanagement going all the way back to the Coleman Young days, Detroit would not be under a consent agreement and Belle Isle would not go under State Control. However, once you dig yourself into a hole, it is hard to get out of. The article says clearly “The deal, announced by Michigan Governor Rick Snyder and Detroit Mayor Bing Sept. 12, would last for 90 years (including two renewals) . . .” It does not state the renewals are subsequent to the 90 years. The article also says clearly that it is the Recreation Passport revenues which will go into a general fund, whether for the state or the DNR. A direct quote from the lease is included. The information in the article comes from the lease agreement itself — there is a link to it at the bottom of the article. Why would you depend on a news story that does not include the full language of the lease for YOUR facts? 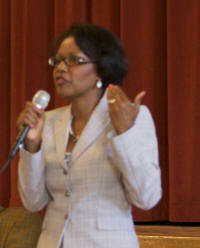 Additionally, please see Councilwoman JoAnn Watson’s presentation on the lease published on VOD Sept. 18. Nice breakdown, but the giant slide has not been “closed for several years.” It’s been open all summer, on weekends.